olympics | Adventures in the Making! For the past five weeks, we have been going to every neighborhood or quartier to deliver health lectures to the community. While there, we meet with the delegate (chief) of the village and his assistants. We then deliver nine lessons over two days followed by questions and demonstrations for the members of the quartier. If we are lucky, the chief will feed us tea and gateaux after the lecture or even a full meal of rice and sauce. At all these lectures, we are blown back at how many people come out to listen and are ready to participate. We have nursing mothers, children, and high school students mainly but there are also many men and older people too. Our lectures were developed by some previous volunteers here at the hospital and we have tweaked them as we see fit for the community. For answering questions, we reward them by handing out toothbrushes and toothpaste. We have lectures from Maternal Health to Malaria to Family Planning. Our Student Missionaries have done a great job thus far of assisting in the delivery of these lessons. We have had several community members say how impressed they were with the lectures, giving sincere gratitude for the little lessons. Most wish they knew these principles when growing up so they could have taught their children. This is not me tooting my own horn here. It is to show that even though we may see these princples as simple and common sense, many people have never been exposed to the radical idea of prevention. Honestly though, this is not much different than in western countries. Instead of not knowing what to do, we know what to do but refuse to do it. We eat that extra side of fries at night and skip the early morning run the next morning. We stress out and freak out without any type of release. Jamie is an awesome handyman and actually rigged the satalite for the Olympics! Sunday, I was able to watch a few events and was in awe at their dedication, skill, and even enjoyment! That is how I want to be: I want to love what I do, be healthy, and enjoy the balance of eustress, rest, fun, and food. So here’s to the new year (well, whatever…)! Here’s to working hard but also playing hard. Here’s to giving back to the community you live in and participating in it. Here’s to just being you! Who knows, we may just end up in Brazil or South Korea for the Olympic Games! *if anyone can tell me how to become a biathalete, I would be more than greatful. Researching here is a bit tricky. **if someone wants to help with my taxes too, that would be awesome. 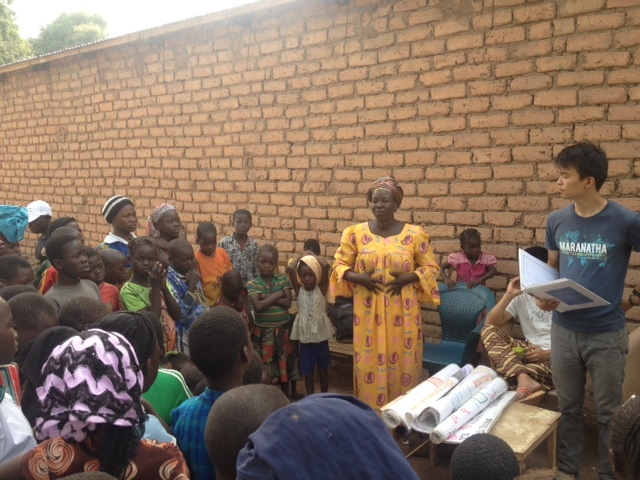 Johnny and Naomi talking about Maternal Health in Tcha-Asse.